To Cite: Navabi A, Soleimanifard S. Enzymatic Characterization of Acid Phosphatase in the Logarithmic and Stationary Phase of Leishmania major Promastigotes, Shiraz E-Med J. 2015 ; 16(1):e26246. doi: 10.17795/semj26246. Background: Leishmania is a protozoa of trypanosomatidae family that leads to a group of disease called leishmaniasis. The pathogenesis of parasite changes during promastigotes growth and proliferation. 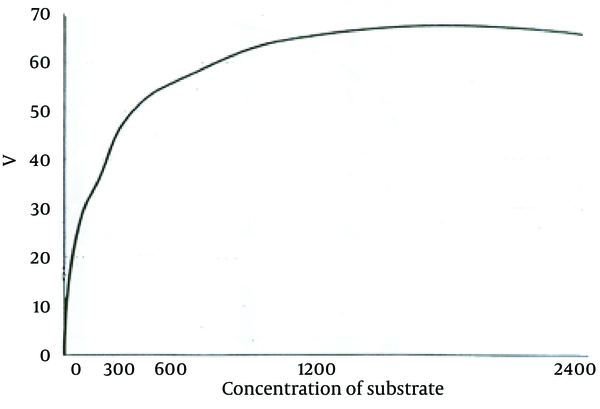 Proliferation of promastigotes includes two stages: logarithmic, and stationary. The parasite is noninfective at logarithmic stage while is infective during the stationary stage. Acid phosphatase (ACP) is one of the factors that supposed to play a role in preservation and survival of the parasites inside the vertebrate host body cells. Objectives: In the present study, ACP enzyme characteristics and its activity during logarithmic and stationary phases of Leishmania major were compared. Materials and Methods: The growth curve of L. major (MRHO/IR/75/ER) was plotted by daily counting cultivated parasites and promastigotes of each stage were collected separately. Frozen promastigotes of each stage were homogenized with sodium acetate and Triton-X-100 and ACP was measured by calorimetric assay. Results: Parasites at logarithmic and stationary phase were collected respectively in the fourth and seventh days. The rate of ACP activity was determined to be 1.18 ± 0.01 in stationary and 0.9 ± 0.03 µM/min/mg protein in logarithmic phases. Moreover, maximum speed of phosphatase enzyme (Vmax) was 98.04 ± 0.96 in stationary phases and 75.76 ± 0.57 in logarithmic. In addition, Michaelis-Menten constant (km) in logarithmic and stationary phase was determined at 142.93 ± 4.08 and 106.39 ± 1.14 µM, respectively (P < 0.05). Conclusions: In logarithmic phase, km of ACP was 28% higher and the rate of ACP activity and Vmax were 23% lower than that of stationary phase. Changes in the specifications of ACP might be one of the important factors for parasites to attack the macrophages and these variations. Leishmania is a protozoa of trypanosomatidae family, Sarcomastigophora class, that causes leishmaniasis, a group of disease with different clinical forms. This parasite is transferred to human body by septic phlebotomus sand-fly bite and lives and proliferates inside phagocyte cells (1). It is estimated that more than 12 million of world population are infected with this parasite. Every year, two million new cases are reported that 1.5 million are cutaneous and 500000 are visceral type (2). Leishmania has two recognizable stages in its life cycle: promastigote and amastigote. Promastigote has a mobile flagellum, spindle body with 15 to 25 μm length and 2 to 3 μm width. At this stage the parasite proliferates in vector sand-fly intestine; then, it goes to the upper part of fly’s digestive system to the back part of oral cavity and pharynx (3). The parasites, which have been inoculated in the skin of vertebrate host, are swallowed by macrophages, converted to amastigote form, and finally, start proliferation. Amastigote form is immobile, non-flagellate and 2 to 5 µ in size, lives inside mammalian host macrophages, and causes leishmaniasis (3). The pathogenesis of parasite changes during promastigotes growth and proliferation (4). 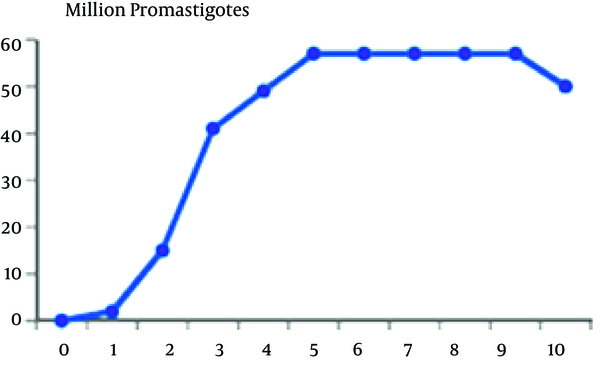 Proliferation of promastigotes includes two stages: logarithmic, and stationary. While the parasite is noninfective at logarithmic stage, it is infective and able to penetrate and settle inside macrophages during stationary stage (4). Promastigotes are called "procyclic" in logarithmic phase and "metacyclic" in stationary phase. In logarithmic phase, promastigotes have a thin cell wall, short flagellum with an empty flagellar pocket, whereas stationary phase or metacyclic promastigotes have a thick cell wall, long flagellum, with a flagellar pocket full of secretory materials, and very few organic cells (5). In meta-cyclic form, flagellum length is 1.8 times longer than in logarithmic promastigotes (5). Immunologically, meta-cyclic form has more resistance to human serum and various temperatures (6). In addition, there are also biochemical differences between these two stages of parasite, including more mobility, more protein, less carbohydrate in metacyclic form; moreover, metacyclogenesis is accompanied with surface changes in their antigens. These changes are specific in different stages of growth (6). For instance, two polypeptides of 51 and 114 kDa in logarithmic phase of respectively Leishmania donovani and Leishmania major were recognized that change to 22 and 38 kDa polypeptides or are lost during transformation to stationary form. Furthermore, a 75 kDa polypeptide was only expressed in metacyclic phase of L. major (6). In metacyclic phase, surface appearance of glycoprotein 63 (GP63) is also increased. GP63 acts as a facilitator in entering process of promastigote to macrophages (7). The flagellar pocket of all trypanosomatidae, including Leishmania, is a specialized zone and it is the mediator of endocytosis and discharges of acid phosphatase (ACP) (7), which is the most frequent secretory protein in Leishmania (8). This enzyme was first recognized in 1925 and plays roles in survival of parasite in sand fly and formation and evolution of parasitophorous vacuole in macrophages by dephosphorylating membrane and preventing macrophages from hydrogen peroxide production (9). Therefore, this phosphatase molecule is one of the factors that might play a role in preservation and survival of the parasite inside the vertebrate host cells (10, 11). Considering that the parasite is noninfective of logarithmic phase and infective in stationary phase with accumulation of ACP inside the flagellar pocket of parasite in stationary phase, it seems that ACP is an effective factor in pathogenesis of the parasite. In the present study, ACP enzyme characteristics and its activity during logarithmic and stationary phases were compared. This was a cross-sectional study. For achieving predicted objective, mass production of leishmania parasite was necessary. Thus, the existing L. major (MRHO/IR/75/ER) in Parasitology Department of Isfahan University of Medical Sciences, Isfahan, Iran, was inoculated to the base of the Balb/c mice tail. Leishmania lesion, which was the source of amastigote for culture, was developed at inoculation site after passing appropriate time (approximately four weeks) to avoid the parasite from undergoing many passages. Cultivating was done using the infected Balb/c mice autopsy, through inoculating the involved tissues such as lymph nodes, liver, and spleen into modified NNN (Novy-MacNeal-Nicolle) medium. Then grown promastigotes, were transferred from this medium to RPMI-1640 (BioIdia, Tehran, Iran) enriched with 10% fetal calf serum (FCS). The growth curve was plotted counting daily-cultivated parasites. According to growth curve and grown parasite morphology, the appropriate days for collecting logarithmic and stationary phase parasite were determined. Promastigotes of each stage were collected separately and after three times washing with phosphate-buffered saline (PBS), they were collected at concentration of 5 × 106/mL in Eppendorf vials. One milliliter of 0.1-M sodium acetate buffer (pH = 5.2) containing 1 mM of MgSO4 and 0.1% Triton-x-100 was added to the frozen promastigotes (4.5 × 106 to 5 × 106 cells/mL). The resultant was homogenized at 4℃ by a glass Teflon homogenizer and centrifuged at 18000 g for 20 minutes at 4℃. The liquid layer on the surface was collected to measure ACP (12). Para nitrophenyl phosphate (PNPP) substrate was used to measure ACP (13). 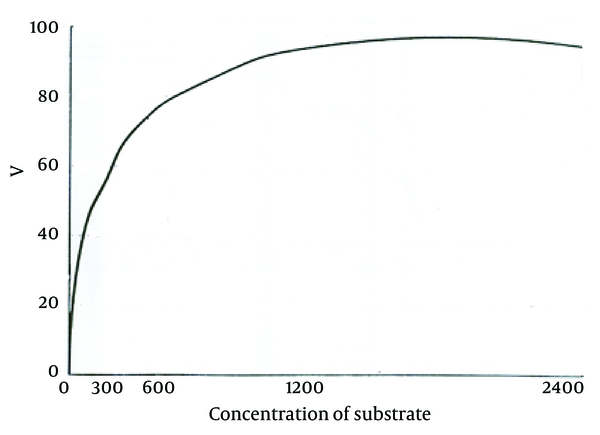 According to this method, 1 mL of mentioned substrate was added to 2 mL of 100-Mm acetate buffer solution at pH of 4.5. After five minutes of incubation in 27℃, the reaction started by adding 300 μL of 125-mM PNPP and after ten minutes, the amount of result PNPP absorption at 405 nm was calculated and enzyme activity was reported based on micromole of hydrolyzed substrate per min per milligram protein. Tartrate inhibitor was used for confirmation of ACP activity and Randox control serum as control. All the stages of the test were repeated five times and their mean was considered as the result. Calculating Michaelis-Menten constant (km) and the maximum speed of phosphatase enzyme (Vmax) using ACP kit (Zistchimi) according to its protocol, serial dilutions of the substrate were prepared; as a result concentrations of 150, 300, 600, and 1200 were obtained. Afterwards, enzyme activities were calculated in these different concentrations; then, by plotting Michaelis-Menten and LinoverBerg curve, Km and Vmax were calculated (9). The obtained results were analyzed using Wilcoxon test through SPSS 10 (SPSS Inc, Chicago, Illinois, the United States). According to the curve, logarithmic phase of parasite growth was from second through fifth day; then stationary phase starts and continues until ninth day. The number of parasites was fixed during this period. From the ninth day, there was gradual decline in the number of promastigotes. According to this curve, the stationary and logarithmic promastigotes were separated in the fourth and seventh days of growth. ACP activity of obtained promastigotes in both phases are shown in Table 1. As it is observed, ACP activity in stationary phase was 23% more than that in logarithmic phase (P < 0.05). Maximum speed of ACP (Vmax) and the values of ACP Km of promastigotes obtained in both logarithmic and stationary phase of growth curve are shown in Table 1 too. As shown in Figures 2 and 3, a reduction of the km value in stationary phase was observed in comparison to the logarithmic phase (P < 0.05). In recent years, physiology of Leishmania, its treatment, and vaccine preparation have been the subject of many researches. Verifying a disease from different aspects is one of the effective ways to confront it successfully. In this research, we intended to investigate ACP characteristics and measure Vmax and km of L. major promastigotes in logarithmic and stationary phases. Stationary phase is an infective stage during which the parasite is able to penetrate macrophages of vertebrate hosts. For a long time, lipophosphoglycan was considered as one of the effective molecules in the severity of pathogenicity of the parasite. However, recent reports have questioned the role of this molecule in pathogenicity, induction, and penetration into the macrophages (14). Some of the other factors that seem to be influential in preservation and survival of parasite inside the host cells are as follows: parasite’s hydrogen pomp, which prevents decrease in environmental pH; producing different types of proteases and superoxide dismutase by the parasite; inhibition of respiratory burst; neutralization of toxic radicals of oxygen; inactivation of lysosome enzyme using gp63; and presence of ACP (15). ACP has a very important role in parasite survival inside the macrophages through dephosphorylating membrane and forbidding macrophages from producing hydrogen peroxide. Growing and proliferating promastigotes are getting ready to invade macrophages of vertebrate host. In this study, the activity of ACP enzyme were assessed in two stages of promastigotes of L. major and significant difference between the activity of this enzyme in the two stages were shown; i.e. the ACP activity was 23% more in stationary phase than in logarithmic phase. In addition, comparing to procyclic promastigotes, metacyclic promastigotes showed 23% increase in Vmax; km in stationary or metacyclic promastigotes revealed 28% reduction in comparison to logarithmic promastigotes. Decrease in Km and increase in Vmax of ACP during metacyclic stage showed that the activity of the enzyme in metacyclic stage was more than the activity in logarithmic stage because enzyme activity is directly related to Vmax and is inversely related to Km. The equilibrium between kinase and phosphatase is necessary for optimum response of macrophages and controlling infection with Leishmania (16). The changes in characteristics of ACP enzyme during growth stage of promastigotes would provide one of the essential factors for invading and penetrating macrophages. The inability of procyclic promastigotes in penetrating macrophages has been proved; on the other hand, the current study showed that ACP activity increases during changing stage of the parasite. ACP is constructed and stored during growth of promastigotes to be used in time of invasion of macrophages. The levels of phosphatases is reported to be different in different species of Leishmania (17). In addition, phosphatase is the major glycoprotein discharged from the parasite in the medium. In previous studies, it was stated that in L. donovani, the pathogenicity could be somehow affected by ACP activity (18). Baghaei et al. showed that the type of scarring in the host can be affected by ACP activity, so that a considerable difference was detected in the Vmax, Km, and enzyme inhibitors among tested groups (9). Assessment of secretory ACP in Leishmania amazonensis showed that this enzyme has acidic and alkaline activity and has roles in maturation of parasitophorous vacuoles and permanence of amastigotes in mammalian host (8). In the time of entry to cell, the parasite requires large quantities of ACP. Since promastigotes stick to the surface of macrophage from side of flagellum and with losing flagella at the arrival, a large amount of ACP are released and for a short time, the production of superoxide ions by macrophages is reduced by 50% (18). ACP has a role in nutrition of promastigotes, as well. The obtained results in this study, which represents the activity of ACP during promastigotes’ growth, shows that while promastigotes are growing, this enzyme is synthesized and stored to be used at the time of promastigotes invasion for feeding and penetrating inside the macrophages and overcoming the existing barriers. ACP is reported to be one of the important and effective molecules responsible for penetrating promastigotes and settling inside macrophages (19, 20). According to the results of this research, the changes in characteristics of this enzyme during transforming noninfectious procyclic to infectious metacyclic promastigotes might be one of the effective factors to make promastigotes infectious and these knowledge about ACP would be useful in prevention and treatment of leishmaniasis. 10. The role of energy metabolism enzymes in physiopathology of Cutaneous Leishmaniasis. Thirteen congress of physiology &amp; pharmacology.